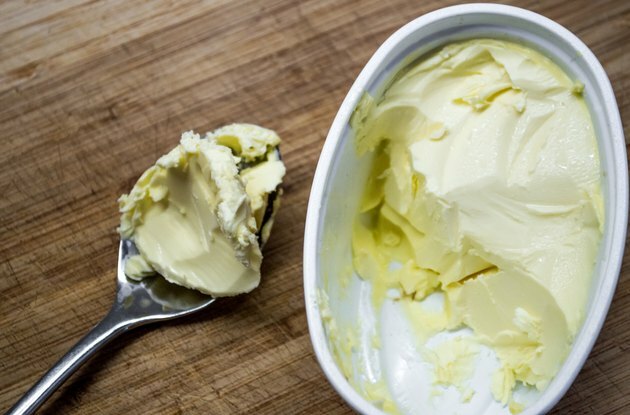 I Can’t Believe It’s Not Butter makes a variety of buttery spreads that purport to be better choices for heart health than real butter. Their products contain beneficial fats, and some are also fortified with essential nutrients. It is still important to use I Can’t Believe It’s Not Butter in moderation, as most varieties are a concentrated source of calories. The original version of I Can’t Believe It’s Not Butter is made from a blend of soybean and canola oils. The product does not contain hydrogenated oil or trans fat. According to I Can’t Believe It’s Not Butter’s website, each 1-tbsp. serving provides 70 calories, 8 g total fat, 2 g saturated fat, 3.5 g polyunsaturated fat, 2.5 g monounsaturated fat and 90 mg sodium. The website notes that the saturated fat content is 5 g less than butter, which contains 7 g per tbsp. The polyunsaturated fat content includes 460 mg of omega-3 fatty acids, which may help reduce inflammation and improve cardiovascular function, according to World’s Healthiest Foods. Each serving of I Can’t Believe It’s Not Butter Light contains 50 percent less fat than the original version. Each tablespoon contains 50 calories, 5 g total fat, 1 g saturated fat, 2.5 g polyunsaturated fat, 1 g monounsaturated fat and 85 mg sodium. The light version has a lower omega-3 content than the original, providing only 250 mg per serving. The Mediterranean Blend version of I Can’t Believe It’s Not Butter contains olive oil, which is a rich source of monounsaturated fat. According to Medline Plus, replacing saturated fat intake with monounsaturated fats may help decrease cardiovascular disease risk. Although it contains olive oil, the product provides roughly the same fat composition as the original version. Each 1-tbsp. serving provides 80 calories, 8 g total fat, 2 g saturated fat, 3.5 g polyunsaturated fat, 2.5 g monounsaturated fat and 90 mg sodium. The Mediterranean Blend provides 400 mg of omega-3s, which is 60 mg less than the original version. I Can’t Believe It’s Not Butter also offers a version containing added calcium and vitamin D. Each tablespoon contains 10 percent of the daily value of calcium and 15 percent of the daily value of vitamin D. Calcium is important for maintaining bone health, while vitamin D acts to enhance the absorption of calcium, according to Office of Dietary Supplements. Each serving is otherwise identical in nutritional content to the light version, except the calcium version contains 90 mg sodium instead of 85 mg. There is also a fat-free version of I Can’t Believe It’s Not Butter. Each tablespoon serving provides only 5 calories and 0 g fat. The product does still contain a moderate amount of sodium at 90 mg per serving. The fat-free product may benefit you if you are trying to follow a low-calorie diet. It is important, however, to remember that fat is an essential nutrient and healthy fats, such as unsaturated fats and omega-3s, should be included in the diet in moderation.